Author(s): Fabiane L. Francisco, Alessandro M. Saviano, Terezinha J. A. Pinto, Felipe R. Lourenco. Departamento de Farmácia, Faculdade de Ciências Farmacêuticas, Universidade de Sao Paulo, Av. Prof. Lineu Prestes, 580 – Bloco 13, CEP 05508-000, Sao Paulo, SP, Brazil. Background: Microbiological assay is the gold-standard method for analyzing antibiotics, since it ensures the success of antimicrobial therapy. However, this method may be time-consuming and it remains almost unaltered since it was first developed. Here, we present the design space of a rapid microplate bioassay for bacitracin. Methods: Triphenyltetrazolium chloride was used in the bioassay to provide faster response. 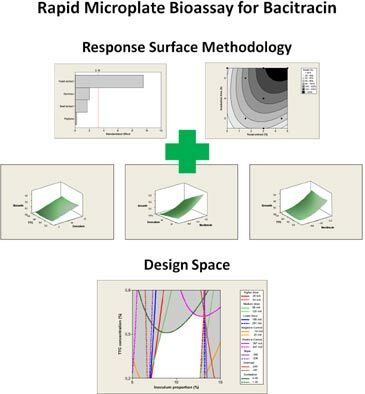 Factorial design and response surface methodologies were used to optimize microorganism, inoculum proportion, culture medium composition, bacitracin concentration, and triphenyltetrazolium chloride concentration. Results: Yeast extract amount in culture medium was a key factor in reducing incubation time and it allowed the development of a faster bioassay. In addition, inoculum proportion was a critical parameter. On the other hand, triphenyltetrazolium chloride concentration did not affect the bioassay response. The bioassay was linear, accurate, precise and robust. Keywords: Analytical quality by design, bacitracin, design space, microbiological assay, response surface methodology. Affiliation:Departamento de Farmácia, Faculdade de Ciências Farmacêuticas, Universidade de Sao Paulo, Av. Prof. Lineu Prestes, 580 – Bloco 13, CEP 05508-000, Sao Paulo, SP, Brazil. Keywords:Analytical quality by design, bacitracin, design space, microbiological assay, response surface methodology. Abstract:Background: Microbiological assay is the gold-standard method for analyzing antibiotics, since it ensures the success of antimicrobial therapy. However, this method may be time-consuming and it remains almost unaltered since it was first developed. Here, we present the design space of a rapid microplate bioassay for bacitracin.